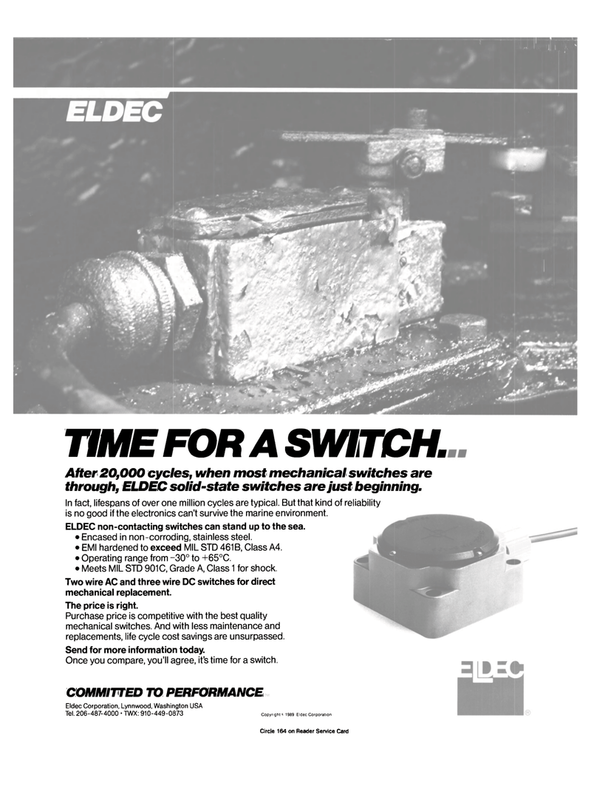 After20,000 cycles, when most mechanical switches are through, ELDEC solid-state switches are just beginning. In fact, lifespans of over one million cycles are typical. But that kind of reliability is no good if the electronics can't survive the marine environment. ELDEC non-contacting switches can stand up to the sea. • Encased in non-corroding, stainless steel. • EMI hardened to exceed MIL STD 461B, Class A4. • Operating range from -30° to +65°C. • Meets MIL STD 901C, Grade A, Class 1 for shock. Two wire AC and three wire DC switches for direct mechanical replacement. Purchase price is competitive with the best quality mechanical switches. And with less maintenance and replacements, life cycle cost savings are unsurpassed. Send for more information today. Once you compare, you'll agree, it's time for a switch.